I'm still waiting for the clever intro to come to me. Read the rest of the newsletter and come back. I'm sure I will have something by then. The new European data protection law, which goes into effect Friday, had spawned fears it could splinter the internet. Instead, most big internet companies are planning to offer global users most of the protections required by the law, known as GDPR. The latest: Microsoft on Monday became the latest tech giant promising to offer users worldwide most or all the tools and protections that are being added in Europe. 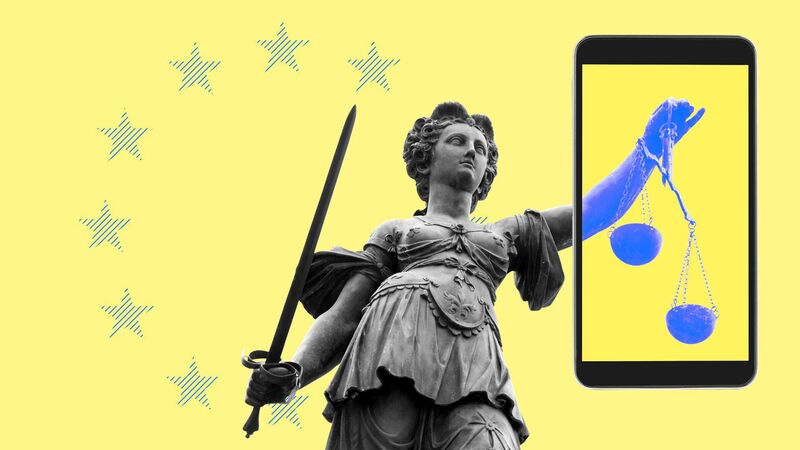 The big picture: Facebook, Google, Apple and Snapchat have said that users globally will enjoy largely similar protections, though in a number of cases users outside Europe may have to wait a bit. And, in some cases, changes made to further protect children are being made only in Europe. The unrealized fear: It appears the idea that GDPR would create a “splinternet” with Europe’s version looking markedly different, similar to China where things are heavily censored, is not going to happen. Yes, but: The companies may be offering users outside Europe similar tools, but those within the EU are protected further by a threat of steep fines if companies fail to live up to GDPR rules. By contrast, those outside Europe have to take companies at their word. Thought bubble, per Sara Fischer: The laws were written somewhat vaguely, which was done by design so that they could adapt to different use cases over time. But this has caused some anxiety for businesses who are still struggling to understand best practices around compliance. Meanwhile: A small number of companies, including adtech firms Drawbridge and Verve, have decided to stop serving European customers rather than face the cost and/or business impact of doing business under the new rules. Stories, the tap-and-swipe vertical format for sharing pictures and videos, are poised to dominate the social web's next era. But, while Snapchat invented and popularized them, it's Facebook that is dominating the space, notes Axios' Scott Rosenberg. Go deeper: Scott has more here. Speaking of Facebook, CEO Mark Zuckerberg is expected to dish out another mea culpa today when he meets with members of the European Parliament to apologize for not doing enough to protect Facebook user data after the Cambridge Analytica scandal, the New York Times reports. Why it matters: Zuckerberg will speak just days before Europe rolls out the GDPR, which is intended to give users more control of how their personal data is used and streamline data processes across the EU. The measure gives European regulators the power to fine companies up to 4% of their global revenue for violations, which, per NYT, would equal $1.6 billion for Facebook. Watch: Zuckerberg will appear before the European Parliament starting at 12:15pm ET/9:15am PT. After some wrangling, it's now set to be livestreamed. Who will win the in-store mobile payments race? While Apple, Google and Samsung are all seen posting healthy growth over the next few years, eMarketer predicts that Starbucks will maintain its lead in terms of number of users through 2022. Americans are split on whether to be concerned about consolidation in the tech, media and telecom sectors, according to a new HarrisX survey. 22% said they supported it and 20% said they opposed it. Zuckerberg will appear before the European Parliament today. (See story above). Okta's Oktane conference kicks off in Las Vegas; Display Week continues in Los Angeles. The U.S. and China have reached an agreement on the outline of a deal that would allow ZTE to resume operations in exchange for significant changes to its board and management, the Wall Street Journal reported. HMD, the company that sells phones under the Nokia brand, raised $100 million in new funding. Bill Gates released his summer list of recommended books, which includes Walter Isaacson's biography of Leonardo DaVinci. Barack and Michelle Obama signed a multi-year production deal with Netflix. Epic Games, maker of Fortnite, committed to fork over $100 million in prize money for competitions. That's notable as it's more than what the top 10 games gave out last year, per VentureBeat. Adobe is paying $1.6 billion to acquire Magento Commerce, an eBay spinoff. Treasury Secretary Steve Mnuchin called on the Justice Department (which he doesn't oversee) to look into the power held by Google and other tech giants. Your hotel may be checking electronically to see if you are stealing that towel, as YouTube star Casey Neistat discovered.